Today is the first Labor Day celebration under the administration of President Rodrigo Roa Duterte (PRRD). Indeed, a quick year had passed when, few days before the Labor Day 2016 celebrations, all presidential candidates, including PRRD, swore before the entire nation to liberate the working class from the endemic problems of contractualization and low wages. 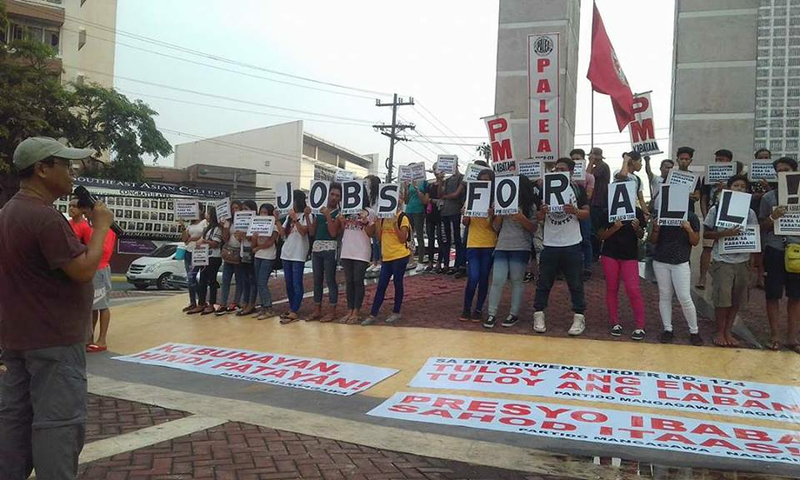 On contractualization, the PRRD vowed to put an end to the despicable practice of agency-hiring. On wages, he promised the abolition of provincial rate system which for decades, created inequity and wide disparities in wages between regions and provinces of the country. Workers had long been fighting for ultimate deliverance from precarious working conditions that made them poor and exploited. Electing a President who pledges to end the problem of contractualization and low wages was therefore a welcome development to many workers. As such, labor organizations under Nagkaisa labor coalition have been very cooperative with the administration in making it sure that the President’s promises are fulfilled. We actively participated in all the workshops, meetings, summits, and Congressional hearings organized by the government to make sure that the interest and specific concerns of the working class on the issue of endo and other rights are recognized and properly addressed by official bodies. We also held countless conferences, consultations and mass actions to demand attention to our grievances. We did all these because we want all forms of contractualization prohibited both in the private and public sector. We even actively sought an audience with the President when we felt betrayed by the labor department on the issue of contractualization. Now the hard questions: Did workers get what they deserve from this level of engagement with the government? Did contractualization end upon the issuance of Department Order (D.O.) 174? Are other labor and human rights more protected now under the new administration? We in Nagkaisa had already expressed our rejection of D.O. 174. Our demand today is for the President to draw up an Executive Order in line with the workers’ demand for total prohibition of agency-hiring and fixed-term employment and also, to certify as an urgent administration measure HB4444 (Mendoza, TUCP-PL) and HB 556 (Bayan Muna, Anakpawis) which seek the same. Furthermore, the government has to finally resolve the long-running dispute on outsourcing between the Philippine Airlines (PAL) and the PAL Employees Association (PALEA) to prove the government’s decisiveness in addressing labor rights violations in giant and powerful companies. On the wage issue, the government should now consider granting workers substantial wage hikes in the face of mounting prices of basic commodities. At the same time, the proposed tripartite commission to review and revise the existing guidelines and rules on wage-setting should be formed immediately. Related to the issue of prices is our demand for the government to adopt new policy measures in addressing the high cost of power and the monopolization of the power industry. And lastly, Nagkaisa has already expressed alarm that some members undertaking legitimate trade union work may have been killed or arrested on trumped up charges under the cloak of the drug war. These agenda remain pending before the Office of the President and other concerned government agencies. Unfortunately the failure to stamp out the problem of contractualization during the last ten months gave this administration a bad mark. And unless this failure is rectified by corrective measures and affirmative actions in relation to other labor rights demands, a slide into further isolation from the working class population is a serious problem that will hound this administration in days to come. Today, thousands of workers, youth and women from our member-organizations will be marching along the streets of Espana and Mendiola in Manila as well as in other major cities of the country like Cebu, Bacolod and Davao. Later today, leaders of Nagkaisa will be meeting with PRRD in Davao City to pursue those concerns and to demand accountability from those entrusted to resolve issues in favor of workers. We will never back down in pressing for these demands through collective negotiations and mass actions. We have regular jobs and security of tenure to win. And we have other labor and human rights to reclaim!